I like Jason Brubaker's posts and his book UNNATURAL TALENT. 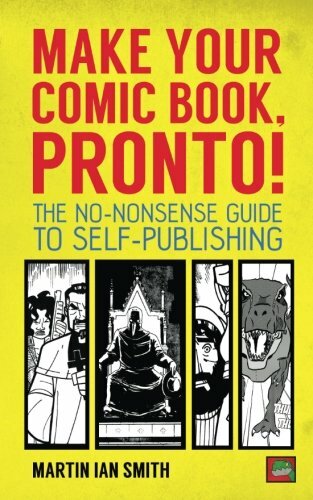 This might be a bit presumptuous, I realise, but I've just written and published a book designed to help people get started in self-publishing comics. (And by "just", I mean exactly that. It went up on Amazon today!) I thought I'd drop in a mention here and see if it might be of use to someone. It's called Make Your Comic Book, Pronto!. I've drawn on over ten years' worth of self-publishing comics to try to present the most straightforward way of getting that first comic book in your hands (and selling it after). I've hired artists through this forum in the past and when I was starting out this place was a massive help for signposting lots of great info on how to get going. The idea for this book was to take everything I've learned over the years - from this site, from some of the great books you guys have mentioned, and from making my own mistakes - and jam it all into one book. I wanted someone to be able to pick it up and get a handle very quickly on what's important in making a professional-standard comic which people will actually want to buy. I use examples from my own work to illustrate what works and what tends to just end up with you sitting with boxes filled with unsold comics. If you think it might be of use and you give it a go, I'd love to know what you think! I just published my new book on Amazon.com. It is an action novel, and a good read. It focuses on our concerns of the tragic deaths of the young children. No worries. They are given a chance to return to earth by their creator to save us all. Not Guardian Angels. Life Angels. Check it out. Haven't seen it mentioned, but for aspiring artists, SYLLABUS: Notes From an Accidental Professor by Lynda Barry is definitely worth a read. She started as a teacher in the art department at the University of Wisconsin-Madison. She compiled a bunch of her notes and student examples into a nice little book. It includes some exercises and insights she discovered over three years of teaching.